Q: How much do the uniform and handbook cost? As with the annual dues, cost should never be a barrier to Scouting. 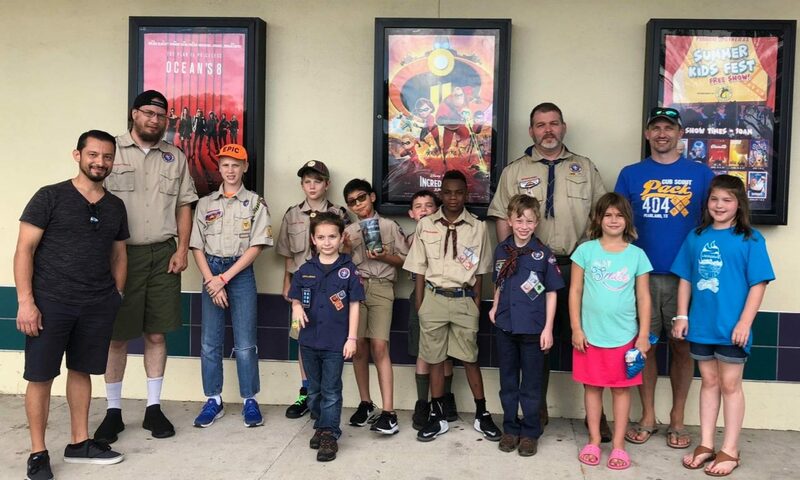 Pack 404 has a “Uniform Exchange” where gently used uniforms that Scouts have outgrown can be placed into inventory, and then larger uniforms that now fit a Scout can be taken out and used. The goal is to create a rotation of uniforms in and out, and reduce the financial expenses for everyone. This is also a great way to account for the physical growth that our Scouts experience during elementary school. Lion Scouts do not wear a full uniform. They wear a t-shirt and hat, which cost about $25 total. An adult leader embroidered polo shirt costs $30. 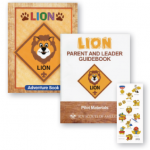 The full set of program materials for the Lion Scout and Parent cost $10. Lion is the first chance for a Scout to join the Pack, so chances are this expense will be covered with your registration. Tigers, Wolves, and Bears wear a blue uniform, which costs about $75 (or $100 with the official shorts and socks). The uniform consists of the shirt, the required patches for the shirt, the neckerchief (the scarf), the neckerchief slide (it secures the neckerchief), the belt and a hat. Adult leaders for these dens and wear a tan uniform. With each new year, the uniform is updated with a new neckerchief, slide and hat for their new den. Scouts also need a new book for that year’s program. This costs about $30 each year. New Scouts joining any den will receive their first handbook included in their dues. Our hope is that the Uniform Exchange can offset much of the expense of the blue uniform during these three years. We only require Scouts to wear the official shirt. The shorts and official socks are optional – blue jeans or navy shorts can be worn instead. For the two years of Webelos, Scouts move into a tan colored uniform, which they will take with them when they transition into Boy Scouting. They retain the same neckerchief, slide and book for both years. While not required, we do encourage our Webelos to wear a more complete uniform, as they begin to prepare for the Scouts BSA program. Shorts and knee socks are encouraged, given the hot weather often makes the official long pants impractical. Q: What uniforms should my Scout wear to Den and Pack meetings? Scouts should wear their pack t-shirt, along with neckerchief/slide, belt and hat to den meetings. Given that Scouts often play outside before their den meetings, or participate in outdoor activities during den meetings, we want to help parents keep the more expensive “Class A” uniform in good condition. Chances are that we will have Scouts from multiple dens meeting at the same time at the church. Being able to easily identify them by den will be helpful. A Scouts BSA policy update in 2016 allows Scouts to wear their neckerchief with a t-shirt, and not just the formal “Class A” field uniform. Scouts should wear the full “Class A” uniform to Pack meetings, complete with belt, neckerchief/slide and hat. The exception here are Lion Scouts, which do not wear the “Class A” uniform. They should wear their official Lion t-shirt. When wearing the “Class A” uniform, we ask that parents help their Scouts wear the uniform properly with the shirt tucked in, and complete the uniform with their neckerchief and slide. Scouts can wear their den hats in the Southway Church building. We do ask that they remove them when entering the Sanctuary for the Pack meeting – a Scout is Reverent. 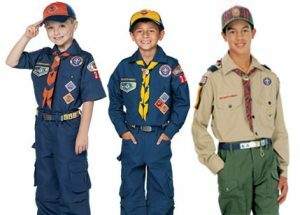 We do recognize that new Scouts may not have a complete uniform for the first few Pack meetings. We ask that parents complete the uniform prior to the new Scouts’ Bobcat Ceremony in October. There will be opportunities in August/September to check out a “Class A” uniform shirt from the Uniform Exchange (based on availability), or purchase one from Bobcat in the Park. Parents can also purchase online via scoutstuff.org, or visit one of the Scout Shops in Houston. There are four in the Houston area, with the one in Stafford having the easiest access from Pearland. Including the pack t-shirt in the Pack dues helps ensure new Scouts can “fit in” with other den members, from the very beginning. For more information about uniforms and cost, see the page on Pack Dues.